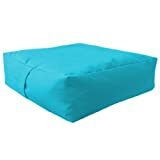 Large Bean Floor Garden Slab Cushion Stool Pouffe in Turquoise, Great for Indoors and Outdoors. Ideal for Relaxing and Occasional seating, Made from High Quality Water Resistant Material, Available in 10 Great Colours. Versatile, Multiple uses (Relaxing, Seating, Stool, Pouffe). Great Indoors & Outdoors. Easy Wipe Clean Material, Ideal for all the Family. Available in 10 Great Colours, There is a colour for Everyone. Measurement: Width 23.5″ (60cm) x Depth 23.5″ (60cm) x Height 7,5″ (20cm), 2 Cubic Feet. Sizes are Approximate. Material: 100% Polyester (Waterproof Material). Filled with Fire Retardant Beads.